NETWORK FINALS: Time zone adjustments on ABC pushed AMERICA’S FUNNIEST HOME VIDEOS down to 0.8, and raised the BILLBOARD MUSIC AWARDS to 2.6, although that was still down 0.6 from last year’s final rating. In addition, BOB’S BURGERS gained 0.1 in final numbers. CABLE HIGHLIGHTS: Despite all the hype in the world, Showtime’s revival of TWIN PEAKS only managed 0.15, and that was without any prior availability online or via VOD. (However, episodes 3 and 4 are currently available in advance of next Sunday’s airing.) Since Showtime is a subscription service, ratings don’t have the same meaning, and the buzz may be enough to make the venture worth doing. But in the numbers themselves, the only good news was that the viewership was relatively stable, starting at 0.16 and dropping to 0.14 in the last quarter-hour, which is a bit surprising given the unusual pacing and tone of the show. Meanwhile, another form of experimentation didn’t score well in linear viewing, as Syfy concluded its marathon of the 12 MONKEYS season at 0.08/278K-0.05/232K–0.05/246K, way down from the 0.12 for 2016’s season finale. The season finale of AMC’s INTO THE BADLANDS lost 0.09 to 0.47, and that’s down a much steeper 0.36 from its December midseason finale (which also didn’t have THE WALKING DEAD as a lead-in). 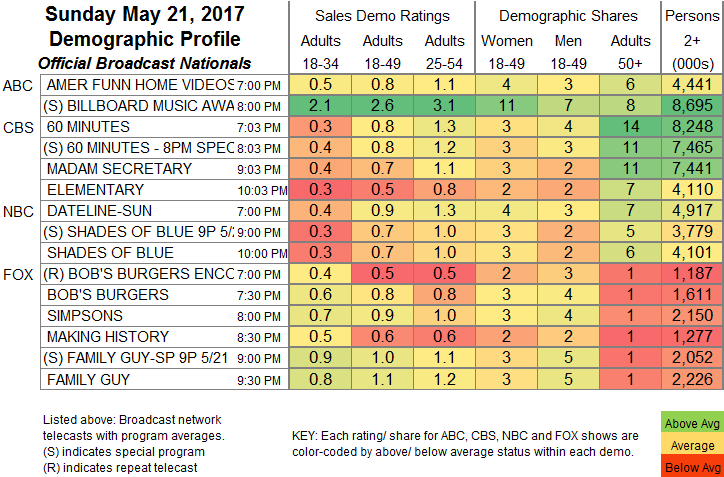 On Lifetime, the 2-hour season finale of MARY KILLS PEOPLE was at 0.17/0.14, compared to last week’s 0.17 hour. On Food Network, the finale of IRON CHEF GAUNTLET jumped 0.15 to 0.53, and FOOD NETWORK STAR returned at 0.40. Elsewhere in scripted: on HBO, THE LEFTOVERS fell 0.09 to 0.29, SILICON VALLEY shed 0.06 to 0.41, VEEP was down 0.02 to 0.23, and LAST WEEK TONIGHT ticked down to 0.49. On Starz, THE WHITE PRINCESS fell 0.05 to 0.22, and AMERICAN GODS was down 0.03 to 0.25. Adult Swim’s MIKE TYSON MYSTERIES dropped 0.11 to 0.56. Hallmark’s THE GOOD WITCH ticked down to 0.19. TNT’s NBA PLAYOFFS game towered over the night at 2.85, and a post-game airing of THE DUNK KING was at 0.72. On Discovery, 2 episodes of NAKED & AFRAID were at 0.72/0.64, compared to last week’s 0.67/0.63. On E!, KEEPING UP WITH THE KARDASHIANS was steady at 0.63, and WHAT HAPPENS AT THE ABBEY ticked up to 0.18. On Bravo, REAL HOUSEWIVES OF THE POTOMAC was at 0.43, and INVITE ONLY CABO was down 0.05 to 0.18. 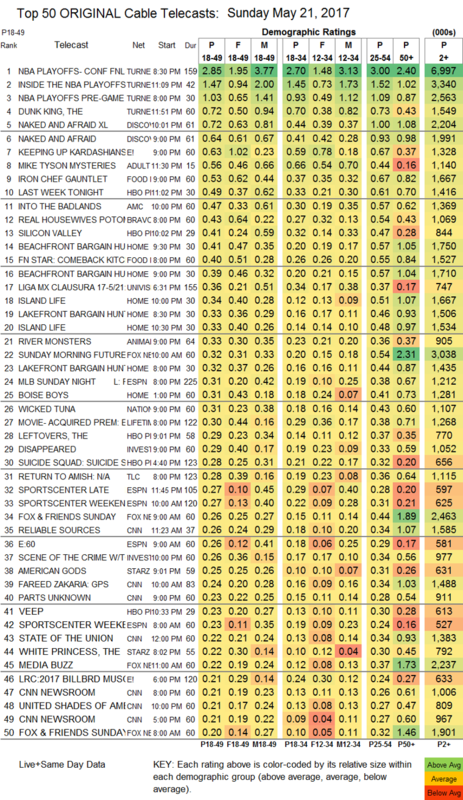 The several HGTV shows on the chart were led by the 9:30PM BEACHFRONT BARGAIN HUNTERS, up a tick to 0.41. ID’s DISAPPEARED was at 0.29, and SCENE OF THE CRIME was at 0.26. On TLC, RETURN TO AMISH lost 0.04 to 0.28, and the AFTER-SHOW was down 0.03 to 0.19.